For 20 years architectural historian Dr James Campbell waited for someone to write a definitive book about libraries. When he decided to write one himself, his research took him to 82 libraries in 21 countries. The Library: A World History is much overdue but well worth waiting for. In 1975 archaeologists investigating the palace of the ancient city of Elba in Syria uncovered a room containing fragments of some 15,000 inscribed tablets. The shelves that once held them had collapsed but, scattered on the ground, the tablets remained roughly in the order in which they had been placed some 4,000 years ago. In 2012 a tiny library opened across the world in Jiaojiehe, north of Beijing. Its Chinese architect designed this exquisite building with an area where visitors can sit by the fire and sip tea, read and dream. The Library: A World History (Thames & Hudson) by Dr James Campbell, an architectural historian in the Department of Architecture at Cambridge University, is the scholarly and highly readable story of what happened between the making of the earliest libraries and the design of their modern counterparts. It is a journey that takes the reader through some of the grandest libraries in the world which in their various ways reflect mankind’s preoccupation with learning as represented by books in all their guises. Campbell’s previous book Brick: A World History is an account of what mankind has constructed by employing the simplest of materials: baked mud. In writing The Library, he reveals not just his passion for books and buildings but also his grasp of the human endeavours that connect the two. Most importantly for us, he is motivated by a desire to share his enthusiasm and expertise. Without compromising on accuracy in his discussion of each of the libraries he visits, he provides a gripping narrative. We asked Dr Campbell five questions about his book and the research that went into it. A world history of the library is an ambitious project. How did it all start? 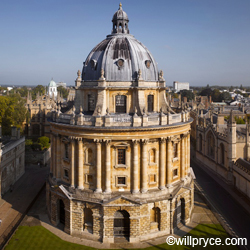 As a student I wrote a dissertation about the Radcliffe Camera in Oxford, a building which is in some ways a mausoleum for its benefactor, the physician Sir John Radcliffe. As I embarked on my research, I looked for a book that told the whole story of the architecture of libraries and found that there really wasn’t one. I waited 20 years for someone to write the kind of book I wanted to read – and when no-one did, I decided that I’d write one myself. I’ve been interested in architecture since I was about eight. It was Lego, I’m afraid: I built a cathedral and that was it. When I was applying to Cambridge to study architecture, I knew that the university was keen that students got a sense of the history of buildings. So I spent a lot of time in the reference section of my local library in Harrogate – one of ten Yorkshire libraries funded by the philanthropist Andrew Carnegie at the turn of the 19th century – researching the architecture of a spa town. The experience opened my eyes to where a library and its contents could take you. As an undergraduate at Cambridge I naturally spent a lot of time in libraries – the wonderful Wren Library at Trinity College, where I was a student, the University Library which I love, and the Old Squire Law Library (now the Library of Gonville and Caius), where I spent a lot of time revising for exams. Libraries have a feel of their own, a smell of their own. It’s something you notice right away when you walk into the UL, the scent of thousands of dusty books – paper, leather, glue – with the inevitable and inimitable whiff of age and decay. So libraries combine two of my interests: buildings and books. In The Library I’ve concentrated on a particular kind of library - some of the world’s finest examples of the buildings designed to house books – and I’ve explored the topic chronologically. Of course, a history of libraries is much more than a compendium of buildings: it’s also a story about the history of art, science, technology, culture, belief and education – and how all these strands mesh together. How does the history of the library reflect the history of the book – and vice versa? Books and the buildings made for them are closely interconnected - with advances in technology shaping both the form that books take and the ways in which they are protected, stored and made available to readers. Books as we know them have their origins in clay tablets which were inscribed with accounts. Next came the use of papyrus and parchment, followed by the development of paper made from textiles, the invention of block printing in the East and mechanical printing press in the West. Jumping almost six centuries, we see the emergence of digital technologies that transformed the storing the storage of, and access to, knowledge over the last ten years. When the first books were produced by hand, there were no libraries. Books were stored in trunks and boxes: there’s a lovely example of an oak chest used to contain books at Merton College, Oxford. 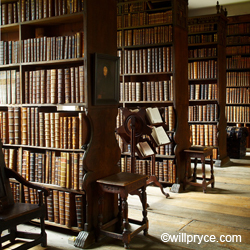 In early libraries, books were stacked on top of each other and read on lecterns. Because they were so precious they were chained to the fixtures that held them in order to prevent theft: you can see marvellous examples of chained libraries at Hereford Cathedral, Wells Cathedral and Trinity Hall, Cambridge. The library at Queens' College, Cambridge, where I am a Fellow, shows evidence of how libraries were adapted over time and to meet changing needs. 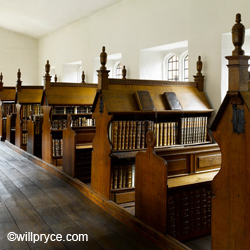 The lecterns made to hold a small number of books were adapted in the later 17th century to make tall bookcases to accommodate the growing number of books in the college collection. The stall system of dividing libraries into alcoves where readers could sit started in the colleges of Oxford and Cambridge and was copied all over the country in public and private libraries. It allowed for a large number of books to be shelved and accessed, with each alcove or bay being a library within a library. Throughout history libraries have often lagged behind advances in technology. The new British Library was 40 years in the making. By the time it was complete, the card system it had been designed to incorporate had been superseded by digital technologies to do the same job using a fraction of the space. What was (and is) the purpose of libraries? One of the primary functions of libraries was, and still is, to protect books from the physical effects of damp, heat and sunlight and from incursions by rodents and insects. Mice love to make nests in paper in the gaps behind books and all kinds of insects will feast on paper, starch, glue and leather. They can cause huge damage. 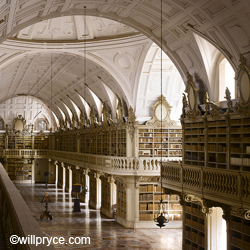 The staff of the 18th-century libraries of Coimbra and Mafra in Portugal allow colonies of tiny bats to roost behind the bookcases in winter and outside in summer. At night the bats emerge and scoop up any insects. In the morning, the librarians have to sweep up the bat droppings. Libraries are all about capturing, storing and cataloguing knowledge. But you only have to glimpse the fabulous photographs that Will Pryce took for the book to understand that libraries are about are about much more than simply housing books. They are about power and status: they are an outward demonstration of learning and accomplishment. Some of the most spectacular libraries – particularly the great Baroque and Rococo examples found in Europe – are theatrical and palatial in their celebration of the arts and sciences. Although many of the great libraries have an impressive sense of space, they weren't designed as places for reading books. Readers would take the books and read them somewhere else: the space is a measure of the importance accorded to the contents. The medieval libraries of the monasteries – which were the great centres of learning in the West - were an attempt to capture all the knowledge in the world in one building. Some of the world’s most stunning historic libraries held what seem to us today very small numbers of books. In 1338 the Sorbonne Library in Paris had 338 books available for consultation and 1,728 books on its register, 300 of which were marked as lost. 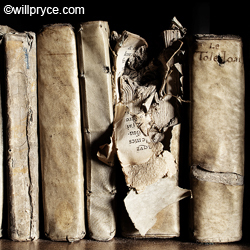 Can you tell us about your partnership with the photographer, Will Pryce? 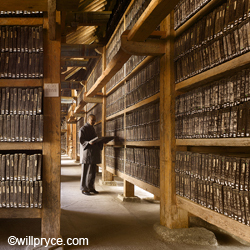 The Library wouldn’t be the book it is without Will Pryce’s skills as an outstanding photographer. Will studied architecture at Cambridge, a few years after me, but later decided to become a photographer and went back to college to study photojournalism. His background in and understanding of architecture is immensely important as it means he is able to take images that give a true sense of the building and, of course, he is a superlative photographer. This book is not just a history of libraries; it is a photographic project as well. You can’t experience a building without physically being there, so Will and I travelled together to all the 82 libraries that feature in the book. When we reached our destination we would discuss the key issues. Will would then pick the shots that he felt best portrayed the library while reflecting what I would be writing. The clarity of the pictures is due to the time it takes to set each shot up. Will uses a large format digital camera which produces stunning pictures of extraordinary resolution. It can take up to an hour to capture a single view. For Will, one of the greatest challenges was light and getting a true representation of the colours. Many of the great libraries we visited for the book are now lit by electric light which turns colours yellow, green or blue so our first task was to persuade the librarians to switch off the lights and let the natural light flood in. Many of the librarians were amazed at how well their libraries were designed in terms of making the most of the natural light. Which of the libraries that you visited would you most like to revisit? It would make most sense to say the Tripitaka Koreana at the Haeinsa Temple in South Korea. One of the biggest hurdles that Will and I faced was gaining permission to visit the libraries we wanted to cover in the book. The most one that proved most inaccessible was the Tripitaka Koreana, a collection of 13th century artefacts described by UNESCO as the most important and complete corpus of Buddhist doctrinal manuscripts in the world. It took three years, and the help of personal contacts, for an agreement about our visit. When we got there – a five and a half hours drive from Seoul – we were allowed to stand at the open door but not allowed to set foot inside. Finally, we were permitted to take just one picture and then, as the day wore on, several others. It was a huge privilege to walk between the great timber shelves which house 81,258 wooden printing blocks, each one of them boiled in salt water, left to dry out for three years and then painstakingly carved by hand. 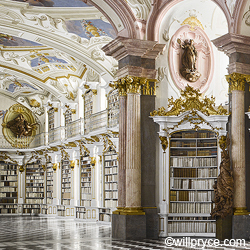 However, the library I would most like to go back to is Admont Abbey Library in Austria. When Will and I went to see it, there was four feet of snow on the ground outside. It was so cold in the library that we wore outdoor winter clothing to keep warm. 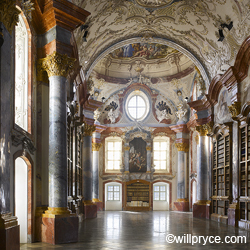 Designed by the architect Josef Hueber and constructed between 1764 and 1774, it is one of the world's longest monastic libraries, 13 metres wide and 72 metres long. The predominant colours are white and gold; when it was built, the abbey's existing books were rebound in white pigskin at enormous expense to match the shelves. The object of monastic study was to reach wisdom and the focus of the sumptuous decorative scheme, commissioned by the abbots to embody the church's teachings, is the figure of Divine Wisdom. The domed ceiling is lavishly pained with classical and religious scenes, the floor is tiled in a dazzling black-and-white three-dimensional pattern, and staircases to the balconied galleries are concealed behind secret doors set into the bookshelves. Walking into this ethereal space is like entering a world of thoughts. Dr James Campbell is a Senior University Lecturer in the Department of Architecture and a Fellow of Queens' College, Cambridge. The Library: A World History by James Campbell with photographs by Will Pryce is published by Thames and Hudson. Inset images from top: Radcliffe Camera (Oxford), Library of the Chapter of Noyon Cathedral (France), Trinity Hall Library (Cambridge), Queens College Library (Cambridge), Mafra Library (Portugal), Altenburg Abbey (Austria), Tripitaka Koreana (Korea), Admont Abbey Library (Austria). Copyright Will Pryce.